So I brought an extra monitor from home with the intention of connecting it with my desktop which is already dual screen. I ended up having problems with my extra video card, so I decided to just connect the third monitor to my laptop and extend the work space. 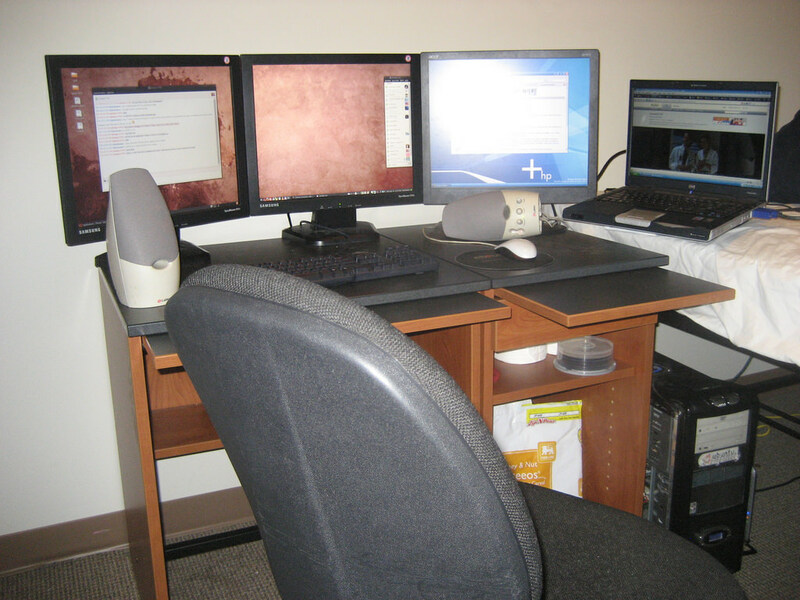 After doing that I was able to connect both computers using Synergy so that I can use my desktop mouse and keyboard across both computers as if all of the monitors were connected to one machine. Here is a quick picture to give you an idea (I’m running out of space on my desk, haha). One cool thing about using two machines like this is that you can be very productive on both and use a great deal of CPU power from one machine and it doesn’t slow down the entire system since the other computer and screens are independent!